THE Z-FACTOR ART COLLECTION is composed of some 200 pieces that have been chosen for artistic merit, uniqueness, or significance in the Zambian art scene. Most of the collection is graphic art, but also paintings and ethnographic artifacts are included. 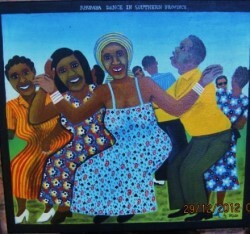 Stephen Kappata: Rhumba Dance in Southern Province. Paint on cloth, 44 x 40 cm, acquired 1996.
access their work and detail of their life by clicking on their name - later, not now! we're still "developing" mind you!